It is a moot point whether I will have enough fabric to get where I want to with this quilt now. I can definitely get somewhere, but whether it's where I wold really like to be only time will tell. I have (I think) plenty of whites and plain blues, particularly the darker ones, but a lot less red. I am right down to the tiniest scraps on several fabrics, but I am piecing the tiny bits together and getting as much out of them as I possibly can. I have revisited this block, which I wasn't so keen on when I made it, and which I'd put aside. It seemed too big now for what I wanted but I went at it with my rotary cutter and ended up with 3 pieces that I like better. The wild ride continues, Kind of like a rodeo, you never know who or what will end up on top. 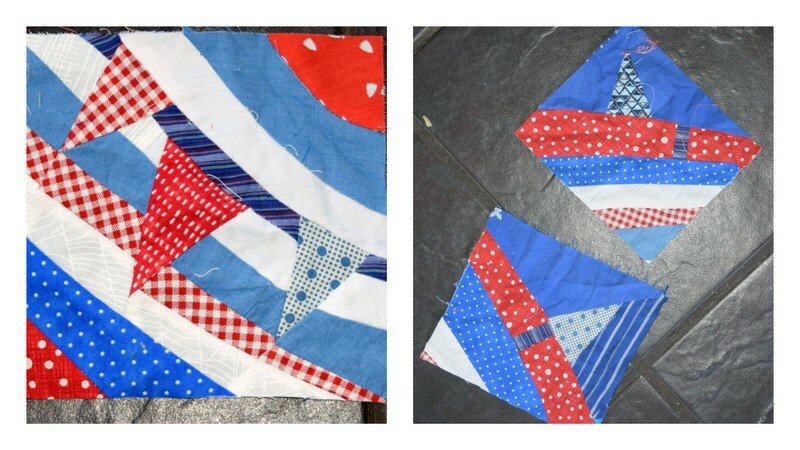 I love how with improv you can continue to cut and reassemble until the right design emerges! Just keep going . . . it gets more wonderful each time you share it! Agree with all above; interestinger and interestinger, if you'll pardon the paraphrase! I love the way this quilt is growing! Beautiful and interesting improv! Brave girl!! I have done this before - very liberating indeed isn't it! What you did is perfect! Adding another curved element would be tricky, but what you added is just slightly curved and doesn't take away from the circular center focal point. I so much regret that I wasn't able to send fabric. I had no idea how expensive and difficult the whole process is. After all, it was just a few little scraps of fabric! You certainly are managing without my pitiful scraps, though. The quilt just keeps getting better. I have to admit, though, I see a picture of one of your blocks (and I really like it)...then you have a go at it and chop it up and things seem even better! Well, I just don't know what to think. Of course when I'm the one chopping up a perfectly good block, I'm perfectly okay and it seems to work out just fine. LOL, your blocks are the only ones I'm struggling to let go of. It must be knowing that you'll run out of fabric eventually. You are so brave in your quilting, and it totally works, I love what you do.